We unfurl our the intricacy and exclusivity of our creations highlighted with this beige colored embroidered party wear satin georgette salwar suit showcased by Sophie Choudry . The semi-stitched salwar suit is made of satin georgette fabric with a heavy floral design embroidered and stone work. The outfit has a beautiful color contrast to make you shine amongst the crowd. The salwar suit comes along with a santoon inner and bottom with banarasi silk dupatta. 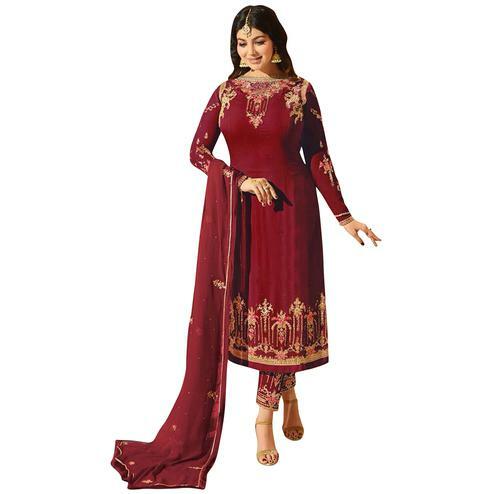 The outfit is for ladies who like heavy embroidered patterns in an ethnic wear.This outfit can be worn at family functions,parties,functions and occasions. Pair this with designer jewellery to get the complete look.